A blogging friend of mine is working to adopt a little girl from a country in Eastern Europe. Melissa has been connecting with some missionaries over in the country she'll be in, and she is going to help distribute slippers for Project Happy Feet. She is asking for slippers, knitted, crocheted, or store bought, and socks to go underneath them. She will take these with her when they travel, and she will be able to distribute them to adults in a handicapped facility and children in orphanages. In the countries in Eastern Europe, the floors in the handicapped homes and orphanages are typically cement, which often gets very cold and damp in the winter. Sometimes it can be so cold, even inside, that standing water can freeze in rooms such as bathrooms that have missing or broken windows. The residents don't have proper footwear for these rooms, no shoes, no slippers, not even socks! Cold feet are miserable feet, but warm feet are happy feet! There are many foot illnesses due to not having footwear, and by providing a resident with slippers, you could even save a life. Melissa hopes to bring slippers, socks, and/or money with her when she travels and she will be able to be there and get pictures when they are handed out. You can visit her blog to find out more about her adoption journey to bring Liza home, and you can visit this post for more info about Project Happy Feet. I am doing a giveaway for Project Happy Feet. For every pair of slippers you make to send to Melissa, your name will be entered once in a drawing. 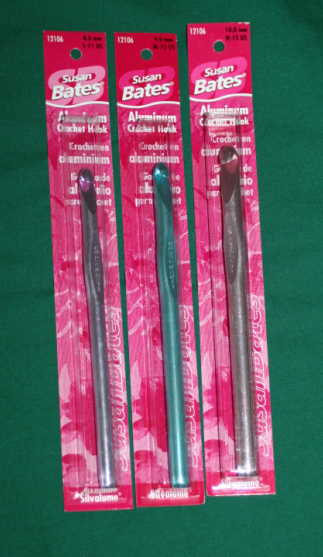 The winner will receive metal crochet hooks, sizes L, M, and N - perfect for making slippers. 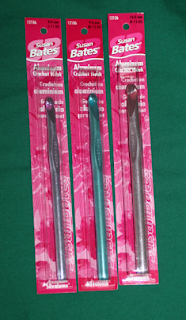 To enter, simply make slippers and send them to Melissa at the address provided in her blog post. After you've mailed them, be sure to email me with your name and number of slippers you donated, and I will enter you in the drawing. (Note - if you live near me, and you want to participate, you can get your slippers to me, and I can ship them with mine.) I will draw the winner when Melissa leaves to travel, which will (hopefully) be sometime in the next few weeks. The pattern I use for slippers can be found here.